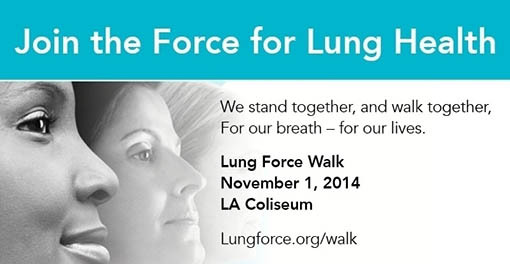 We walk because of the frightening rise of Lung Cancer in women. Singer and actress, Kristin Chenoweth, will be onsite as our special guest to help kick off the LUNG FORCE Walk in Los Angeles! Hear Kristin talk about her personal experience living with asthma and an exciting public service campaign she is a part of called Know Your Count! For more information, visit www.KnowYourCount.com. Join our emcees, Whit Johnson & Daniella Guzman, co-anchors of "Today in LA" morning news on NBC4 Southern California on Saturday, November 1, at LUNG FORCE Walk - Los Angeles in Exposition Park! This year's exciting event includes LUNG FORCE passport travel, family fun, musical performances, a special appearance by the Laker Girls, LUNG FORCE Hero meet & greet, and a wonderful 5K walk in the park as well as a LUNG FORCE loop option --- a shorter route for those with breathing difficulties.